The Western Australian Government established a small experimental farm on the Ord in 1941. This farm was abandoned in 1945 and the Kimberley Research Station was established in its current location on the Ivanhoe Plain as part of a State and Commonwealth joint venture. By 1958 the State Government was convinced of the viability of an irrigated scheme on the Ord and following the agreement of cost sharing between the federal and state government the first stage of the project was commenced with the construction of the diversion dam at Kununurra (Lake Kununurra) between 1959 and 1962. Kununurra was gazetted as a town in 1961 prior to the first trial farms being released in 1962 with commercial farming commencing the following year. By 1966, 31 irrigated farms had been allocated. The second stage of the development was the daming of the Ord River 50 kilometers up stream to form Lake Argyle. This was completed during the period 1969 to 1972. Lake Argyle was filled to storage capacity by January 1974. â€¨Lake Argyle has a storage capacity of 10,760 million cubic metres (gigalitres) of water – of this 335 gigalitres is allocated for irrigation of Ord Stage 1. Water is gravity fed from Lake Kununurra to farms via a series of open supply channels using a range of structures to regulate the flow. In 1997 a 30 megawatt hydro-power station constructed at the base of the Ord Dam was opened. 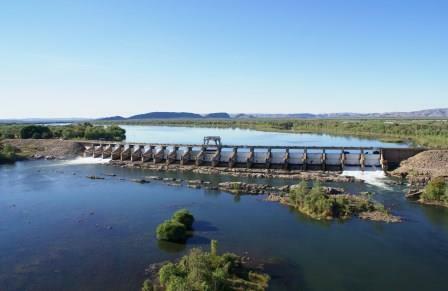 The power station produces approximately 210 gigawatt hours of electricity per annum and supplies a clean renewable energy to Kununurra, Wyndham, Argyle Diamond Mine and Lake Argyle . Ord Stage 1 includes approximately 14,000 hectares of developed irrigated land. A diverse range of crops including: chickpeas, borlotti beans, maize, melons, pumpkins, mangoes, sandalwood, citrus, hybrid seed production, bananas and irrigated pasture are the major crops currently being grown. In addition considerable trial work is being undertaken into new crops including rice and cotton. Sugar cane was a significant crop for the area from 1997 â€“ 2007. Ord Expansion will see an additional 8,000 hectares being developed by 2011.